Extremely unique property of over an acre of pure delight. This 3-bedroom, 3-bathroom and 2-story home is indeed rare to find. As you drive in from South Mellonville Avenue, there are stately trees along the way to greet you. Once you are on the property, it is completely out in the country with no city traffic or noise. Peaceful fountain with a small pond at the front as you walk into the front door. Upstairs you will find the huge living room and dining room with balcony, a kitchen with an island and walk in pantry, a laundry room, a gigantic master suite as well as a second bedroom. Master bath has dual vanity with one of a kind sauna. You can relax in the sauna and jump into the shower for a quick refreshing cool off. Downstairs you will find a family room with wood burning fireplace, another master suite, as well as kitchen facility. As a matter of fact, this can be separate 2-family living quarters with each of its own entrance. There is a build-in BBQ pit at the back porch, as well as a campfire pit for toasting marshmallow, how cool is that on your own backyard? Owner has built a little building to house the well equipment, plus a storage of 31 x 36 for yard equipment, or boat, or camper. 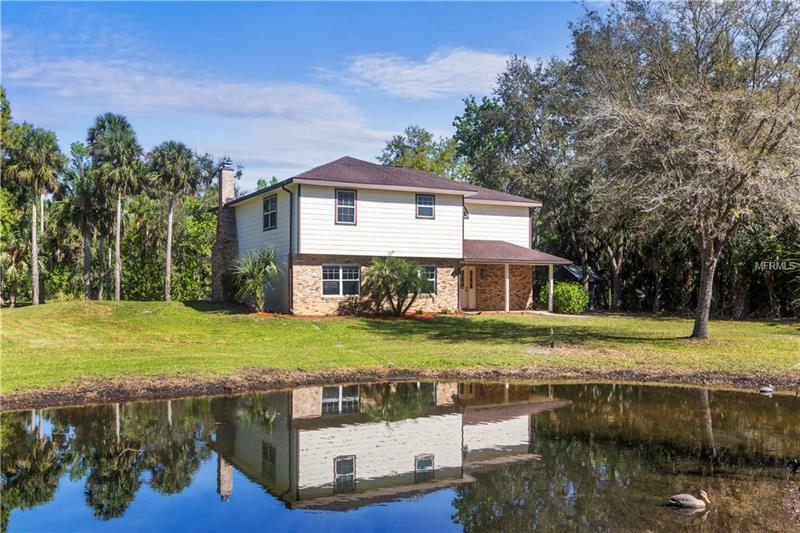 Though you feel completely out in the country with birds singing, fresh breeze, and soft wind through the leaves on the trees, it is actually very close to the Sanford International Airport, plus 417, 427, 17-92, and Seminole Town Center. Come and see for yourself.